The 2017 award for entrepreneurial teacher of the year has been awarded to Robert Forchheimer, professor emeritus at the Department of Electrical Engineering. A true entrepreneur who has supported many young academics and achieved entrepreneurial success in his own right. This is the sixth year that the award for entrepreneurial teacher of the year, founded and presented by LiU Innovation, has been given. Its purpose is to encourage actions that enable knowledge and ideas that arise at LiU to benefit the society around the university. The prize was awarded by Gio Fornell from LiU Innovation during the recent Leadership Day at LiU. The prize money amounts to SEK 20,000, and this year was awarded to Professor Emeritus Robert Forchheimer. “Turning out that way” is due originally to Ingemar Ingemarsson, who was Robert Forchheimer’s supervisor in the 1970s. He took with him some of his research students when he started the Sectra company. Robert Forchheimer points out that Sectra is a prime example of how research results can become a product. He was a member of the board of directors in the company for 21 years, until it was listed on the stock exchange in 1999. He spent some time as a post-doc to the US around this time, and the idea he had there formed the basis for the IVP company, which he founded in 1985. This idea concerned inspection systems in industry. “It took, however, eight years before the company actually manufactured the product,” says Robert Forchheimer. During his whole career he has been involved in teaching, at both undergraduate and postgraduate levels. He was appointed Professor of Coding Theory in 2006. Robert Forchheimer became professor emeritus some years ago, but this has not led to him reducing his activities. He has a full-time role as teacher and supervisor. 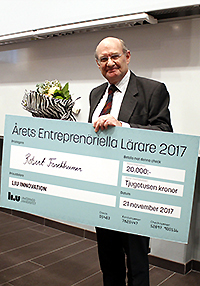 “LiU Innovation has awarded the LiU Entrepreneurial Teacher Prize for 2017 to Robert Forchheimer for several entrepreneurial successes. He is a true entrepreneurial teacher who has supported many young academic entrepreneurs and helped them along the path to success. He plays a significant role in the collaboration between LiU and Science Park Mjärdevi, where several of his protégés are active.